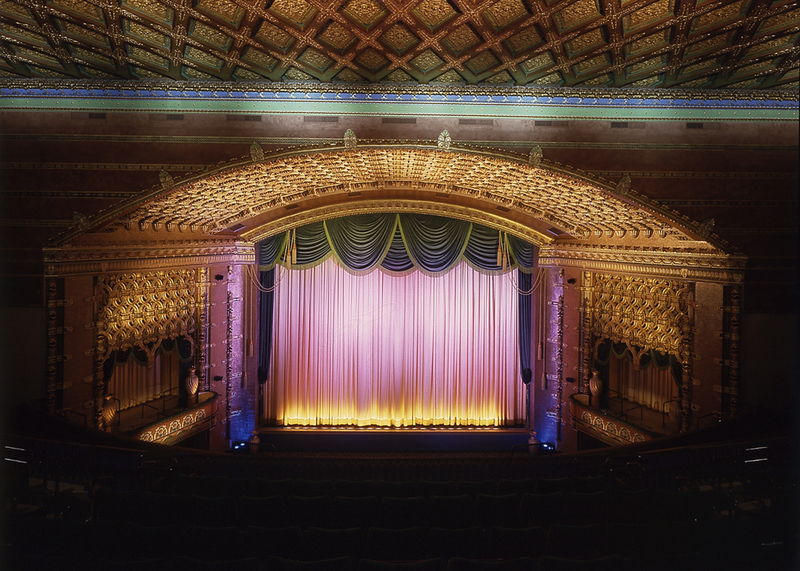 In 1989, The Walt Disney Company joined forces with Pacific Theatres to begin a two-year archeological dig, which led to a museum-quality restoration of the legendary palace – the El Capitan Theater. California Restoration & Waterproofing, The California Restoration Specialist ™, was selected along with our subcontractors and artists to repair the historic ‘fabric’ of the theater. This included the cleaning of all historic surfaces, the replication and installation of missing or damaged plaster and concrete details, and the application of artistic finishes to the various historic ceilings and entrance lobby enclosure. Built in 1926, this historic theater has undergone numerous remodeling efforts. Unfortunately, the renovations of decades ago were for the “modernization” of the structure with no appreciation for the charm of this unique edifice. During these efforts much of the original ornamentation was damaged, removed, or covered. CRW began its restoration efforts by researching missing details and designs by comparing the historic photos with the surviving remnants of the sculptured surfaces. A previous modernization had left five large holes (each hole measuring six feet by four feet) cut through the ornate proscenium ceiling. This had undoubtedly been a cheap and quick way to install the air conditioning ducts in the 1950s or 1960s. Solution: Create urethane molds of the missing sections of the ceiling. Hand cut the new plaster pieces to fit exactly into the voids and tie them into place within the ceiling. Edges were then smoothed with plaster. Decorative artwork was then applied to blend the ceiling together once again. The exterior lobby walls complete with wonderful gargoyles and fenestrated relief work had been covered with travertine panels as part of a previous modernization. Many holes had been cut through the walls for utilities or doorways resulting in damage to the Beaux relief. Solution: Remove the travertine and the mortar. Clean and repair existing details. Create and cast new elements (roundels, shields, etc.) for use where the damage to the walls was more than could be sculpted back into place (i.e. where doors had been cut through the walls). These pieces were fitted in the field, cemented into place and then further reinforced using ¼-inch thick wire ties. Details at damaged gargoyles were successfully re-sculpted. The exterior lobby ceiling with its colorful and dramatic stencil art had, likewise, been damaged for the sake of changing tastes and modernization. The ceiling had suffered holes being punched through it to allow tie wires to penetrate for the support of a dropped ceiling. Solution: Carefully repair the holes in the ceiling before the ceiling was cleaned and the artwork was restored. All surfaces were colorized with the intent of using techniques and finishes that were as true to the original as possible (i.e. stencil art, silver foils with orange shellac, gold leaf, etc). The El Capitan Theater debuted on May 3, 1926, as "Hollywood's First Home of Spoken Drama." The theater's elaborate cast-concrete Spanish Colonial exterior was designed by architectural firm Morgan, Walls, and Clements. 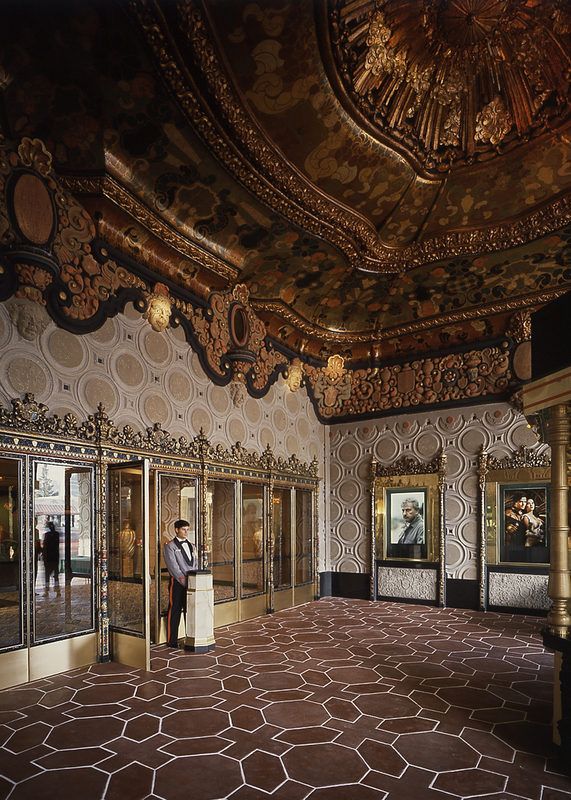 Theatre designer G. Albert Lansburgh designed its East Indian interior. For a decade it presented live plays, with over 120 productions. By the late 1930s, the El Capitan felt the economic effects of the Depression, showcasing fewer and fewer productions. This period saw a cycle of experimentation with entertainment. In an effort to boost attendance to the theater, its management attempted to lure revues, road shows and benefits. When Orson Welles was unable to locate a theater owner willing to risk screening Citizen Kane, he turned to the El Capitan, and in 1941, Citizen Kane had its world premere at the El Capitan.